Do you want a cheap windscreen replacement of your Opel Vivaro? The Opel Vivaro will know many people as the van of the originally German brand Opel. For both private individuals and companies, it is an ideal means of transport that is available in various versions. For example, a two- or four-door model can be chosen and the number of passengers varies from three to no less than nine. If you are in possession of this van, the windscreen replacement of the Opel Vivaro may be necessary. This can cost you a lot of money at a brand dealer, but fortunately there is also a much cheaper way to replace the windscreen. For the Opel Vivaro, it is easy to order a new windscreen from us at a low price. How you can benefit from these advantages can be read here. Before we go into the details of replacing your Opel Vivaro windscreen, we will first tell you more about the special history of the creation of this van. Opel has existed since 1862 and, after adventures in the production of sewing machines and bicycles, started to focus on the development of cars in 1899. As early as 1929, Opel was largely taken over by the American General Motors, and in 1931 the company was wholly owned by the Americans. Because Opel soon joined an international automotive company, it is not surprising that many models are available as rebatched versions under various brand names. General Motors also owns, among other things, the car brands Cadillac, Chevrolet, Corvette and in the past Daewoo and Pontiac. Although General Motors sold Opel and Vauxhall to Peugeot-Citroën in 2017, Opel Vivaro dates back to the time when the American company was in control. Opel Vivaro is a partnership with Renault and Nissan. This first generation of the Opel Vivaro was sold from 2001 to 2014 and was, thanks to its diversity, competitive price and reliability, a very popular vehicle. It is interesting to see how the brands in question divided production. For example, Renault Trafic, Nissan Primastar and Opel Vivaro/Vauxhall Vivaro were made in a General Motors plant in the UK. However, the elevated versions of this van did not fit into this factory, which is why a Nissan factory near Barcelona was chosen. The Opel Vivaro also received a considerable facelift in 2006. Because the characteristics of the van have remained almost the same, this is not seen as a new generation. Following the success of the first generation of Opel Vivaro, the Opel Vivaro B was released in 2014. In addition, a Fiat version of this car was published in 2016. The Opel Vivaro B is still in production today and is not only much more streamlined but also significantly more economical than its predecessor. The Opel Vivaro B comes back from the General Motors factory in England, while the elevated version this time rolls off the tyre at Sandouville in France. Do you want the windscreen replacement of your Opel Vivaro? If you are looking for an inexpensive way to replace the windscreen of your Opel Vivaro, we are the perfect choice. At a brand dealer you can replace a front or rear window of an Opel Vivaro, but there you have to pay a lot more. This is because they sell a car window with a brand logo. These car windows can only be sold by authorised brand dealers and therefore, to a large extent, they can set the price themselves. As a result, you as a customer have to pay more than is strictly necessary. We offer aftermarket automotive glass that may be sold by non-brand dealers due to the absence of a brand logo. However, the car windows come from exactly the same factory and the same production line and are therefore of the same high quality. The price is many times lower and therefore very advantageous for you as a customer. Replacing your Opel Vivaro windscreen via us will result in interesting savings compared to having the same job carried out by a brand dealer. When should I replace the Opel Vivaro windscreen? As soon as there is a crack in the windscreen of your Opel Vivaro, it is advisable to replace the car window. This is because the stiffness of the car window is much less as soon as there is a crack in it. Automotive glass without damage is very strong because of the special technique and the materials used in the production. The window consists of three layers. These are two layers of glass with a layer of PVB film in between. During production, the vehicle glass is heated very quickly, while cooling goes slowly. Due to the products used and the production method, the car window is very strong and therefore provides protection in the event of an accident, for example. If there is a crack in the front window, however, the strength is considerably less and this can lead to dangerous situations. Reflecting sunlight or the light from headlights and lampposts in the crack is also dangerous because it can cause glare. So do not drive around with a crack in automotive glass, but have the windscreen replaced of the Opel Vivaro so that you can safely get back on the road. Order the car window from us and place it yourself if you have the necessary knowledge in house. If you do not have this expertise, our FOCWA certified partners will be happy to help you. 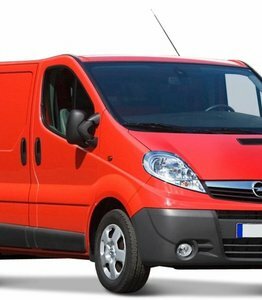 They will also provide on-site windscreen replacement for your Opel Vivaro. In both cases, windscreen replacement prices are much lower than what you will have to pay at a brand dealer. So order a new windscreen today for the lowest price.